South Africa's Kenny Solomon earns IM Title! Kenny Solomon of South Africa has won the IM title by virtue of his excellent showing at the recent African Individual Championships. 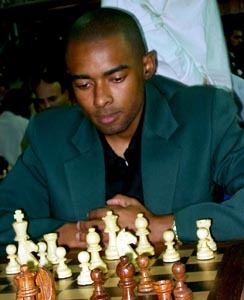 Solomon scored 6½-2½ and qualified for the World Championship cycle with four other players including another young African star, IM Amon Simutowe. Solomon is a very determined young man who recently told The Chess Drum that he was looking forward to the African Championships and that he was working hard. He claimed that his participation in the "Annotation Chess Clash" helped him prepare for this tournament. To clinch the IM title, Solomon beat Egyptian International Master, Imed Abdelnabbi in an excting last-round encounter. After gaining a slight edge in the position, Solomon mobilized his pieces took advantage of an oversight by uncorking 17.Nxf7! With black's defenses shattered, a favorable endgame ensued and Solomon gained advantages on both sides of the board… a majority on the queenside and an advanced king on the kingside. After 56.b6! black's overloaded bishop became a wishbone and was soon pulled apart by pawns on opposite wings. South Africa now has five IMs, two within the last year with Johannes Mabusela's triumph at the 2002 African Junior. They join George Michelakis (2432) , Watu Kobese (2404) and David Gluckman (2356). Solomon is probably the hottest star in Africa apart from Egyptian phenom, IM Ahmed Adly (2448), the 2001 African Junior champion and also a World Championship qualifier with his 6½-2½ score. We certainly with Kenny Solomon the best in the upcoming World Championship cycle. Congratulations to one of Africa's newest IMs!